Rare, original, GPO antique bakelite telephone. Fully-restored and working. 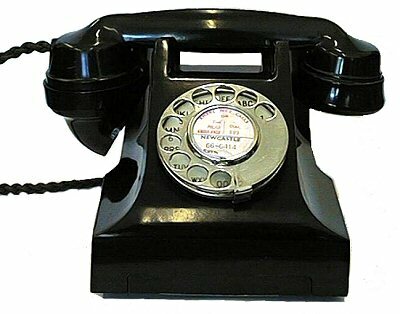 First designed by Ericsson in 1932, this became the GPO standard (332) phone largely produced in the 1940s and 1950s. Now half a century old, a very popular working nostalgic phone. Most were black in colour, and the relatively small number of black-coloured versions that remain today has resulted in these ones becoming increasingly rare and sought after, especially those in the wonderful condition we are offering here.Supplied with a modern BT plug as standard, or with a suitable plug for your network if sent to a different country. All telephones have a 12 month guarantee. We also offer a full repair service.